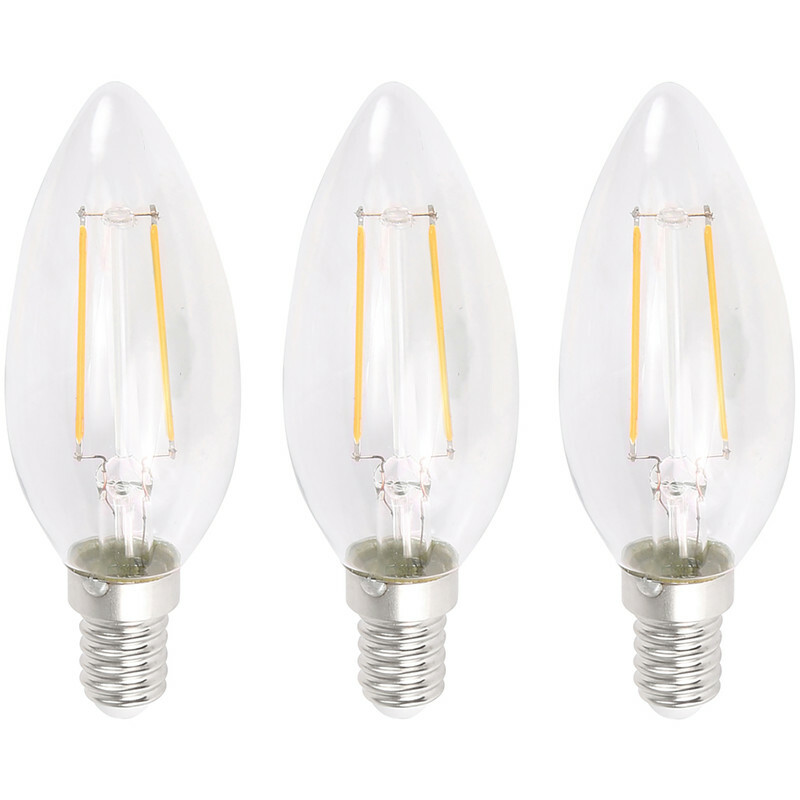 LED Filament Candle Lamp 2W SES (E14) 230lm (3 Pack) is rated 4.5 out of 5 by 43. Rated 1 out of 5 by bearmane from Maridian Lighting Filament Candle Lamps I purchased 6 of these and two have failed already within three weeks. I shall be returning these fro replacements, complete with my invoice. Rated 5 out of 5 by stupid woman from look good in the lamp as no shades . good price, long hours of use, cheap to run, win win all round. Rated 5 out of 5 by Swag from They give a decent light. They give a decent light, comparable with similar size halogen bulbs. They were bought for their reduced operating heat as other types had burned out due to insulating shrouded/holder. Up to date the LEDs are still working well. Rated 5 out of 5 by The Helping Handy Man from So small so bright Only 3x 2 watts much better than the 40 watts I had before. What a saving. Rated 5 out of 5 by Old Neil from Good value for money Replaced most of my 40 and 60watt bulbs with these. Good amount of light for 2w. Rated 5 out of 5 by A knuckle dragger from Not a cold harsh bright light I've been looking for SBC candle LEDs 2W or lower at a reasonable price for a long time as I needed 6. These replaced 6 white glass "warm" LEDs which had a harsh cold too bright light (because there are 6 lamps). These are perfect for this location but now I'd also like some of 1W or 1.5W to get just a soft warm glow as there are 12 (!!!) lights. Rated 5 out of 5 by Nicky1947 from Lightbulbs - work OK Bought because I needed some low wattage BC bulbs quickly.